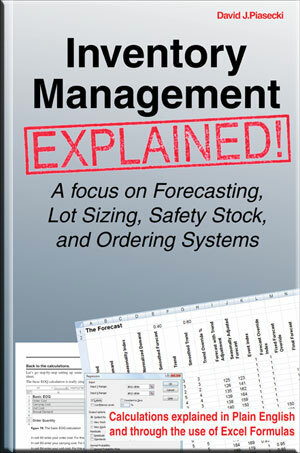 A focus on Forecasting, Lot Sizing, Safety Stock, and Ordering Systems. Welcome to the companion website to my book. Here you will find information about the book, plus supplemental materials intended for readers of the book. Below are some quick links to key areas of the site. See Book Info for more information on the book. View Sample Pages from the Book. Find out where you can Order the Book. See Updates & Extras for supplemental information including corrections, clarifications, and Cut&Paste formulas to help with setting up the spreadsheet examples from the book. Check out the Links Page. Go to the Contact Form to submit comments or questions on the book.